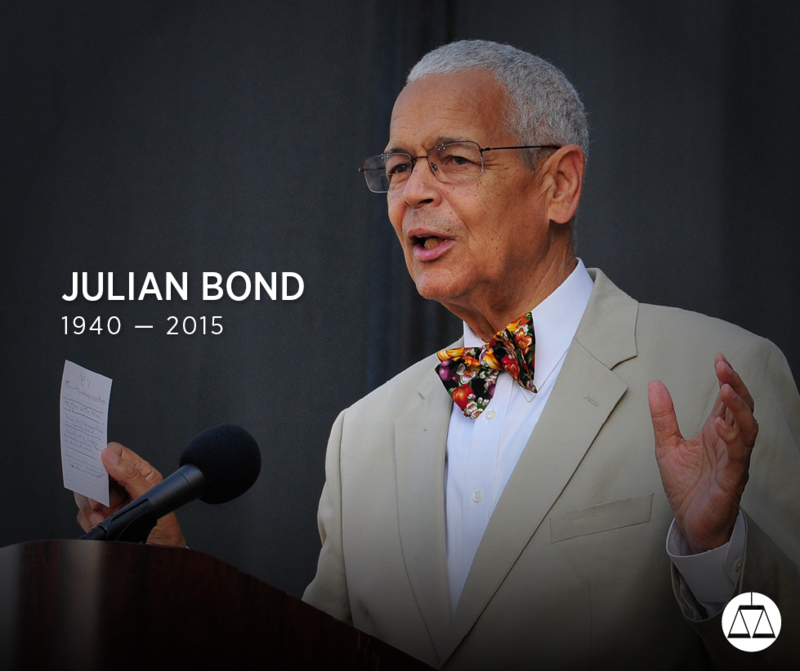 It is with great sadness that we announce the passing of legendary civil rights activist Julian Bond, SPLC's first president. He was 75 years old and died last evening, August 15, in Fort Walton Beach, Florida. From his days as the co-founder and communications director of the Student Nonviolent Coordinating Committee in the 1960s to his chairmanship of the NAACP in the 21st century, Julian was a visionary and tireless champion for civil and human rights. He served as the SPLC's president from our founding in 1971 to 1979, and later as a member of its board of directors. With Julian's passing, the country has lost one of its most passionate and eloquent voices for the cause of justice. He advocated not just for African Americans, but for every group, indeed every person subject to oppression and discrimination, because he recognized the common humanity in us all. Julian is survived by his wife, Pamela Horowitz, a former SPLC staff attorney, and his five children. Not only has the country lost a hero today, we've lost a great friend. Read more about Julian's life and his work with the SPLC here.